Sometimes it just takes a little elbow grease and some kindness to make a difference in someone’s life. That’s exactly what is happening thanks to a bit of help from students at Chetek-Weyerhaeuser High School, who, in cooperation with the Chetek Food Shelf, have started a new program this year to provide weekend meals for less fortunate students at Roselawn Elementary. As it turns out, backpacks aren’t just for bringing home school work. The new Weekend Meals for Kids Program came to fruition after CWHS Future Business Leaders of America Advisor Kristen Goldsmith presented the idea to her FBLA students. She had participated in a similar activity at a previous school district and proposed doing something similar at CWHS. Simply stated, the Weekend Meal program provides students who might not otherwise have access to full, healthy meals, an opportunity to take some food home with them for the weekend. It wasn’t long before a couple of students took to the idea and almost immediately jumped in to help. CWHS Junior Darien Traczyk was one of those students. So, towards the end of the last school year, Traczyk and other students led the push to get the logistics of the program moving. They began gathering prices, determining numbers and even created a presentation for school administrators. Once school officials were on board, students also began working closely with the Chetek Food Shelf to put the final touches on the program. A flyer was sent home to Roselawn parents at the beginning of this school year as a way to collect names of students and their teachers to put together numbers and a list of those interested in participating. Pretty soon, the plan was ready to be implemented. 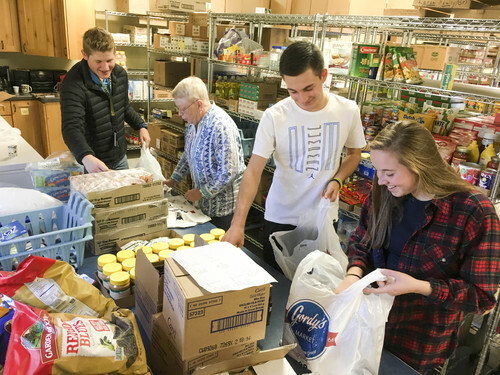 Once all of the names were in place, FBLA students who wanted to be involved began going over to the food shelf each Wednesday to fill grocery bags to provide the program’s students. With the help of special donations and the food already used at the Food Shelf, the students put together the bags and bring them to Roselawn for distribution. Most of the meals are typically some kind of pasta, like macaroni and cheese or a meat and pasta or soup. The bags also often include a snack, like peanut butter and crackers, and a treat—perhaps some canned fruit. They also send home some cereal for breakfast. They don’t have the ability to keep things refrigerated, so fresh fruits and veggies are not an option at the moment. Most of the food is dependent upon what the Feed My People organization is offering for that week. 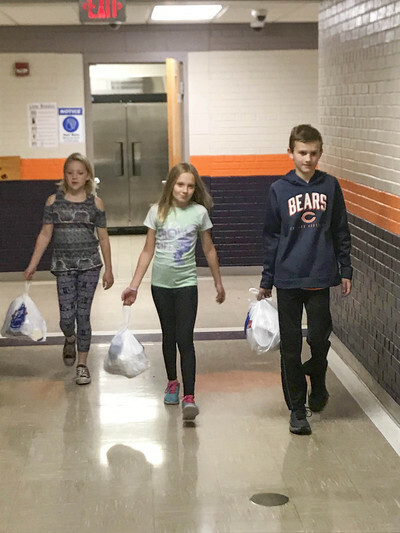 On Fridays, a special group of fifth-grade students bring the appropriate number of bags to individual teachers. The teachers, with the utmost discretion during work time, insert the bags of food into students’ backpacks for the weekend. There are no names on the bags, and students are unaware of who is getting the additional meals. Although the program is still in its infancy, the response has been very positive. Several business and organizations have already inquired about donating to the program, and individual donations continue to come in as well. For Traczyk, seeing the program finally come to fruition has been a huge reward. School officials have also been very excited with how the program has started off, and are also very grateful for the support the program has received from many in the community. Traczyk notes that the program assists more than 40 students at Roselawn, and hopes that one day they can see the program expand to more elementary students and even to students at the middle school. He knows there are more families out there who could benefit from the program—if they are willing to receive the help. “I just wish we could reach out to more people and say, ‘We just want to help!’ Traczyk adds. For those interested in assisting with the program, monetary donations can be made to the Chetek Food Shelf with CW Backpack Program written in the check memo. Fifth-grade students helping deliver the meals that will go into the backpacks for students over the weekend!